Parakeets are social butterflies. They enjoy companionship and want to get along with their person. The recipe for a successful relationship with your parakeet isn't difficult -- good care and plenty of attention fill the bill. Your little friend depends on you for his well-being. 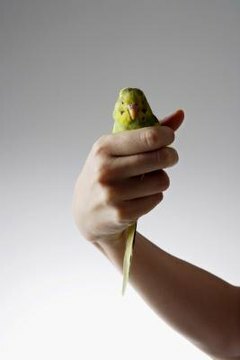 Try to spend quality time with your parakeet, or budgerigar, every day. While you must care for his physical needs -- cleaning the cage, providing him with fresh water, seed and fruits and veggies -- pay attention to his emotional and mental requirements. Talk to him frequently and spend time training him. That consists of handling him gently every day so that he begins to trust you. Feed him treats of fruits and veggies while holding him so that he looks forward to being handled. While your parakeet likes getting out of his cage for exercise, make sure he's safe during his flight time. All the doors and windows in the room must be closed, so he can't escape. Cover large mirrors so he doesn't fly into them. If you share your home with cats or dogs, they should be elsewhere when Budgie is flying. If you're away from home during most of the day, consider getting your parakeet a companion. If you have a male parakeet, choose another male or a female. If your original bird is a female, you are better off getting her a male companion. Two females sharing the same cage can lead to fighting over territory. While keeping a male and female together might mean courtship behavior and mating, you can remove any eggs from the cage if you don't want to raise little budgies. To ensure your birds don't pay more attention to each other than to you, it's important to train your initial bird. Trained birds look forward to treats and human interaction. Keep the second bird in a separate cage for a few weeks for both quarantine and training purposes. Provide your pet with plenty of toys to keep him entertained. Rotate toys frequently so he doesn't get bored. Purchase toys designed especially for pet birds, without sharp edges or little pieces your parakeet can swallow -- expect him to take toys apart. Place a mirror in his cage so he always has a pretty bird in the vicinity. He also needs a variety of perches, especially natural ones made of soft woods from fruit trees or oaks and maples. These woods, which should be changed regularly, give him healthy chewing opportunities.